You don't have to wait 20 years, like I did, to move in the supernatural power of God. Once you know WHAT to do, it is simply a matter of doing it. You take your newfound understanding of how to move in the Spirit and you walk out on the water in faith and discover the anointing of God rests upon you and flows through you. Let us teach you how! You Are Called to Be Supernatural! Jesus healed the sick, cast out demons, and empowered His disciples to do the same (Mk. 16:15-18). Jesus also told them they would speak with new tongues, which they did in the book of Acts (Acts 1:8). So, can I do this? Can you do this? The answer is a resounding YES! Jesus has given His power to you. All you must do is learn to move in it. So in this introductory package, we are going to give you an overview of the understandings you must have and the steps you need to take. How Will I Benefit from This Package? Utilizing this training bundle allows you to easily facilitate this transforming experience with a group of your friends. Videos are 27 minutes long. Inexpensive enough for you to purchase for $1 each and use as a free handout for those seeking to receive the baptism in the Holy Spirit and the evidence of speaking in tongues. Many practical ideas for healing. Gives you a number of simple, concrete steps to take as you pray for healing. Encourages you to explore and discover what works best for you. "4 Keys to Divine Healing" - a hand out sheet for you and your group will be provided as an additional free electronic PDF download with this order. 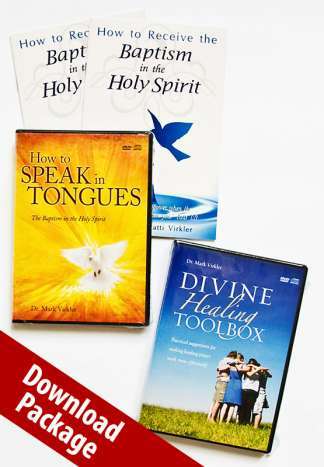 "Introduction to the Supernatural Video Download Package" Includes These Resources! The video download is perfect to release anointed instruction to your group. The 27-minute length is perfect for a home group or a Sunday school class, as it allows you to both receive the training and then break into prayer teams of 3-5 and minister healing to those in need. Take Charge of Your Health training package provides a greater understanding of health.